Published May 2, 2017 at 478 × 600 in New Church Art Dedicated!. 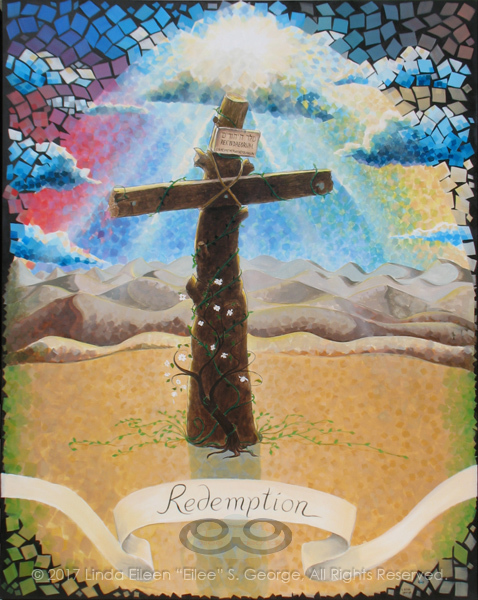 Digital photo of acrylic painting entitled “Redemption: The Tree of the Cross” © 2017 (Linda) “Eilee” S. George, 48″w x 60″h, part of the “3 Trees” Triptych within the Israel Series for Calvary Community Baptist Church in Northglenn, CO; lovingly painted with squarish strokes in a Neo-Pixelist style in colors including ochre, cream, mauve, plum, red, salmon, yellow, purple, blue, olive, charcoal, black, green, lime, violet, fuschia, indigo, sepia, gold, brown, beige and white, depicting the Tree of the Cross Calvary/Golgotha against a background of distant Jericho’s barren mountains and dunes, a symbolic blooming dogwood sapling and life-affirming vines growing at the base of its trunk and a dramatic burst of sun rays from darkened clouds with the light of hope sent by God; signed L. Eilee George with logo – Eilee George of eileegeorge.com exhibits unique concepts and images of her own creation – this is a copyrighted image (and painting/detail) © 2017 L. Eilee S. George, All Rights Reserved. Not to be used in whole or in part or any derivative thereof, without strict written permission by L. Eilee S. George.